Alison Parker is a Canadian film director and producer living in Vancouver. She began her career as a sound engineer and editor. She then went on to build and run her own film studio. In 2010, Alison turned her focus to directing her own films. 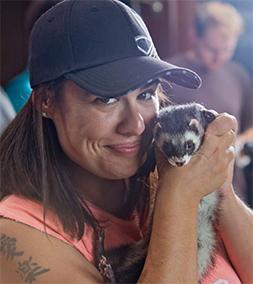 Undeterred by the old adage, â€œNever work with children or animals,â€ Alison created a franchise of movies featuring children and animals, specifically ferrets. Her films have garnered a following of enthusiastic fans from all over the world. Alisonâ€™s credits include Jake and Jasper: A Ferret Tale which won Best Short Film at the 2012 Nevada Film Festival and the Gold Remi Award at the 2012 Worldfest-Houston International Film & Video Festival. Parkerâ€™s pet, Falcor the Ferret, stars in the majority of her films, is professionally trained as an animal actor, and has his own IMDb page. Unfortunately, Falcor was unable to make the trip with her. Alison is the Director of The Magic Ferret which won Best Short Film at the 2014 Canada International Film Festival in Vancouver. Itâ€™s in the Magic Time (Grade 1-3) package at 9:30 am and 12:30 pm on Tues, May 6 at the Jan Cinema, and at 10:45 am on Wed, May 7 at Grande Prairie Live Theatre, and at 11:30 am on Sat, May 10 at Grande Prairie Live Theatre. She will participate in a 15-minute Q&A after these screenings. Alison will also visit classrooms upon request to show her film and participate in Q&A sessions with students.